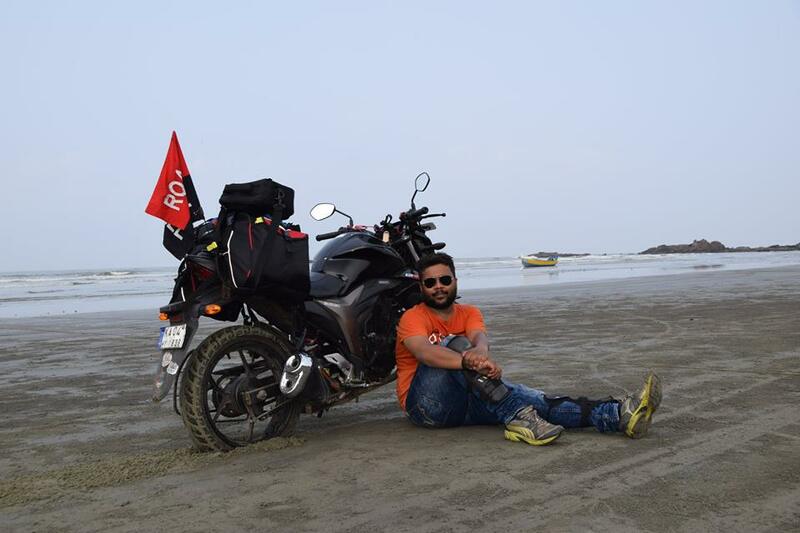 Bikes: TVS Apache, Hero Karizma, RE Thunderbird350 and Suzuki Gixxer. As we had a long weekend geared in the mid of April’2017 we wanted to go for a long epic ride. A practice ride before we hit Leh Ladakh. 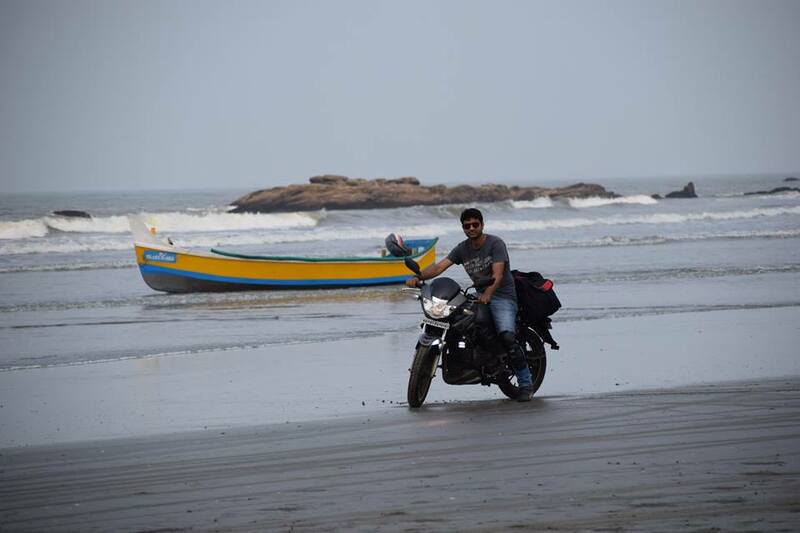 This was our ride from Bangalore to Ooty – Muzhippalangad Beach – Bekal Fort. 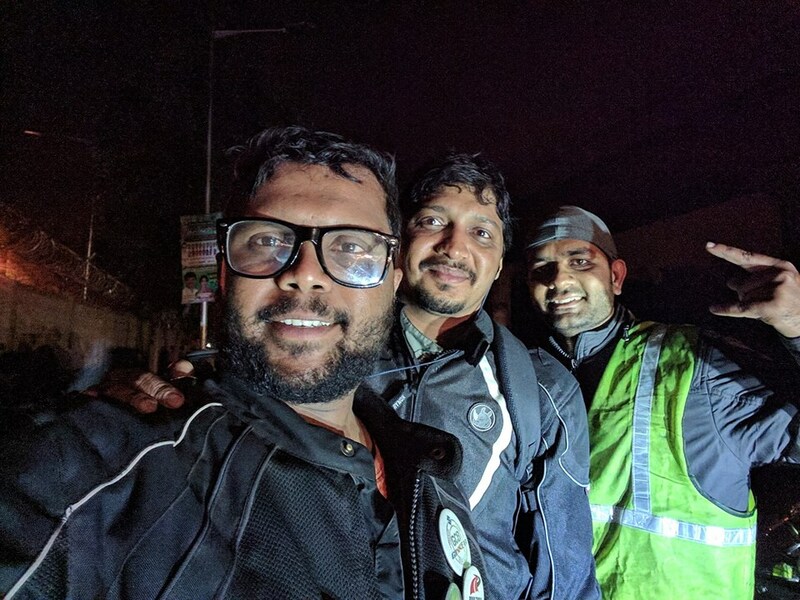 We started at 4am from Nayandahalli Bridge, Mysore Road. All of us were riding with full of passion, the excitement, thinking about how this journey would be. 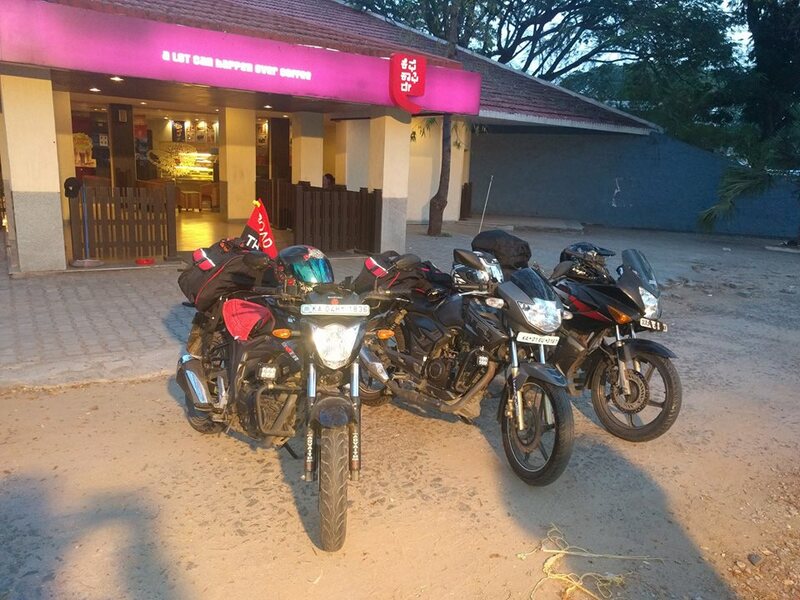 We had our 1st pit-stop of the day at Maddhur CCD, sipping some tea along with some biscuits; I could see the excitement and that smile on everyone’s face as this epic journey was planned long back for the month of February but actually happening now in April. 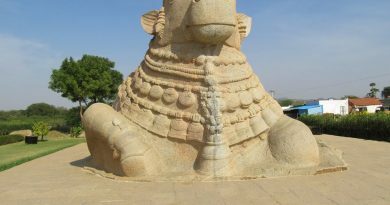 Upon reaching Mysore, we exited the Bangalore – Mysore highway taking the Mysore Outer Ring Road. 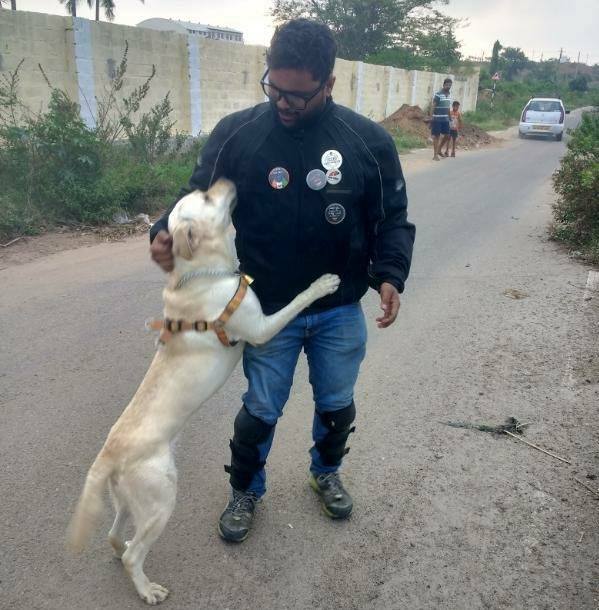 We had a small pitstop, where I meet “Lucky – The Labrador”, as I always mentioned in my previous blogs that for every ride I go, I have memories with these pets. We had a quick breakfast at the road side hotel here to fill our tummy with some delicious dosas. 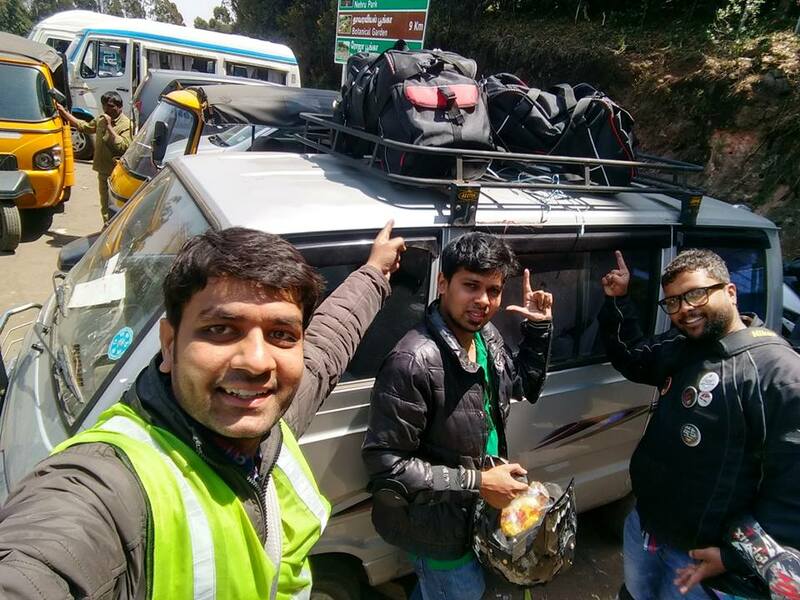 The journey continued as we kept riding on the ring road and took a left that lead to Ooty. 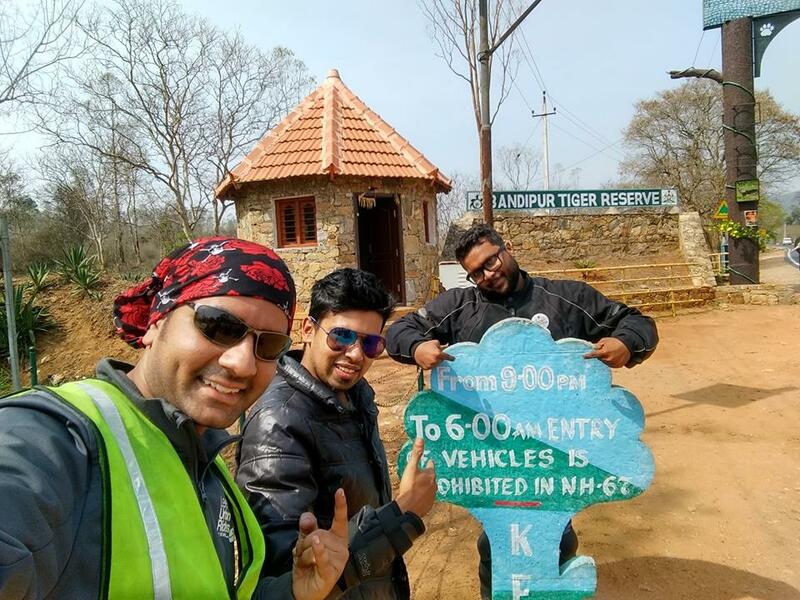 Upon reaching Bandipur Forest Checkpost we stopped over to grab some water bottles and a small pitstop for photo-session. 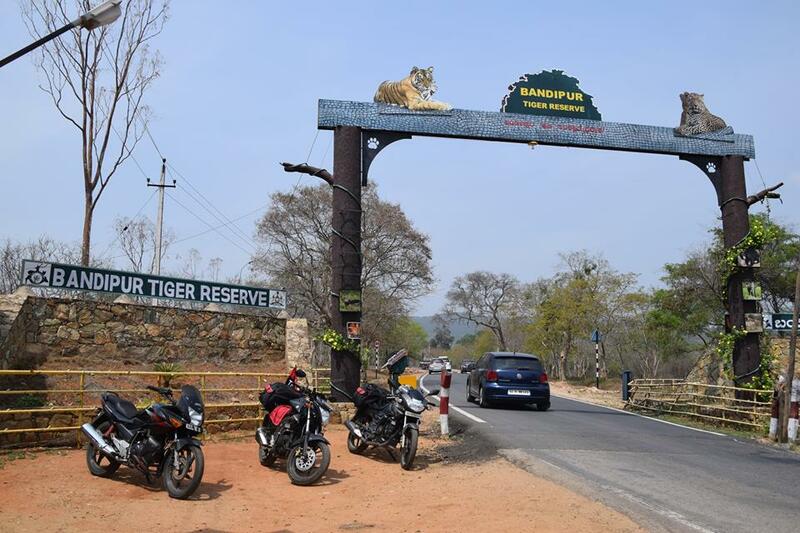 Please be aware, Bandipur Forest has time restrictions. 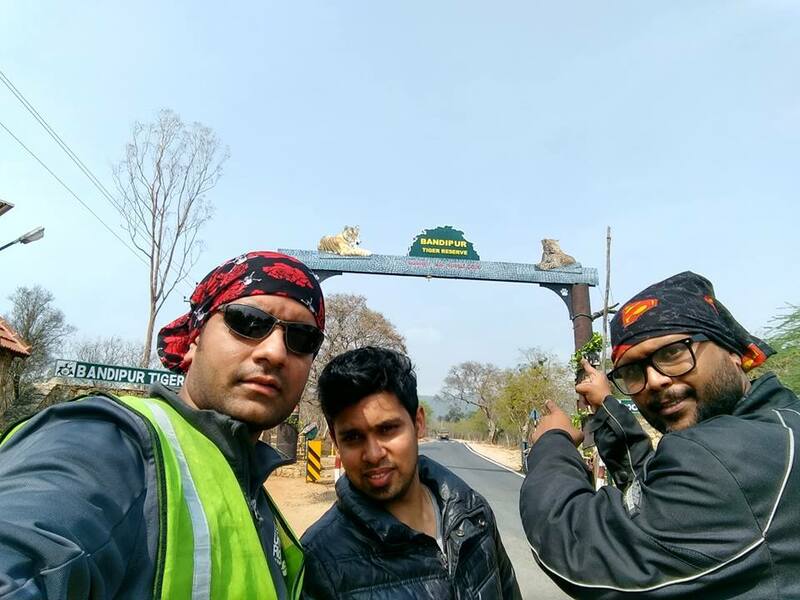 The ride through the Bandipur forests and Madhumalai forest was an amazing experience. 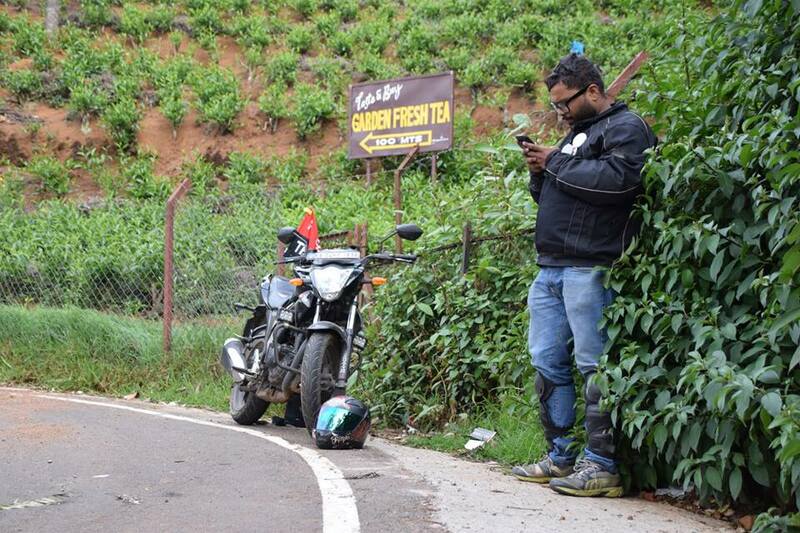 Once you pass through Madhumalai forest roads, the stretch of 36 Hair Pin bend to Ooty starts. 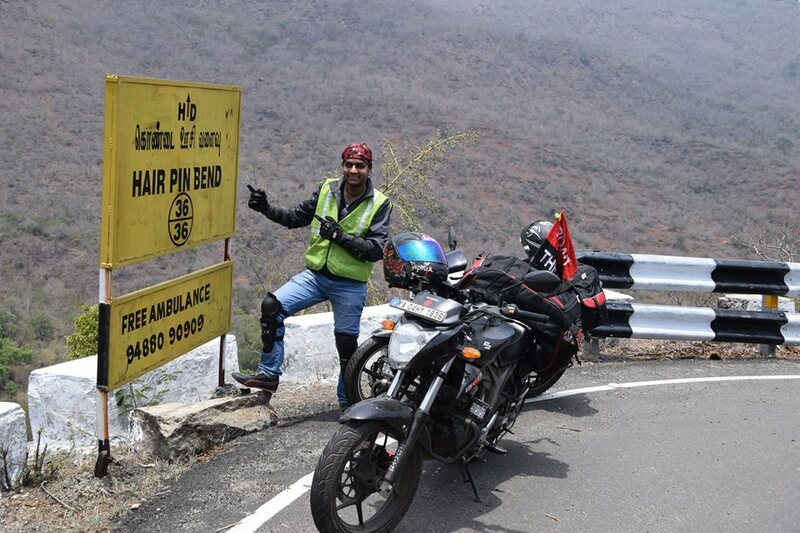 Riding uphill over 36 hairpin bends was an ultimate experience. We could glimpse a couple of tea estates as we kept riding uphill. 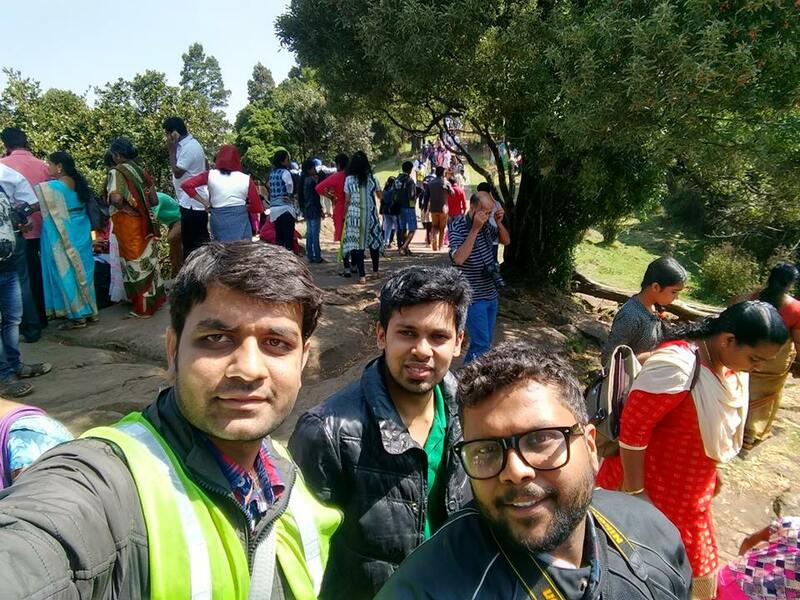 It was noon until we reached Ooty, and as it was a long weekend we could see lot many tourist landing here. As we entered the city limits, we stopped over for lunch at Youth Hostel. As we had lunch, we quickly checked for accommodation in Youth Hostel and to our bad all the rooms were full. 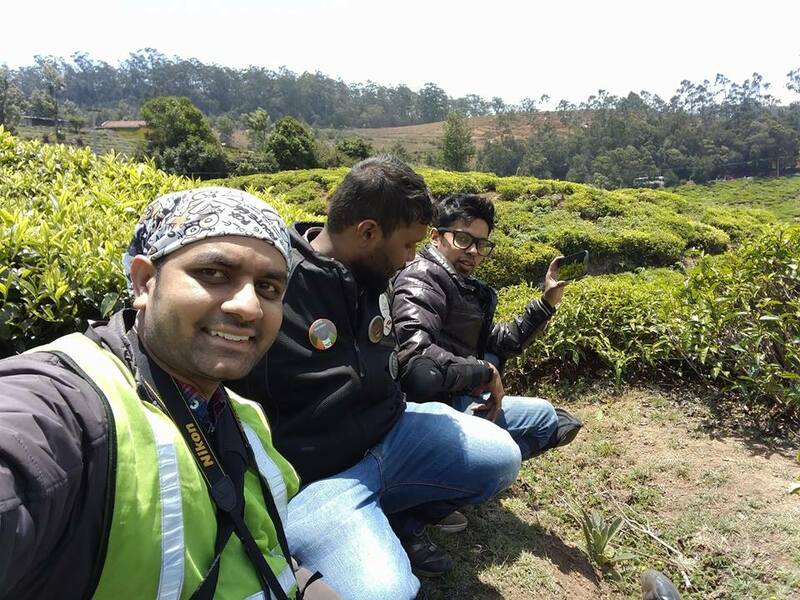 We got a normal hotel near Ooty Race course, we freshened ourselves and we straight went to Doddabetta peak. It was 4.30pm until we reached the Doddabetta base and the security guard there stopped us at the junction and sent us back saying it’s closing time as the timings was only till 5.00pm. 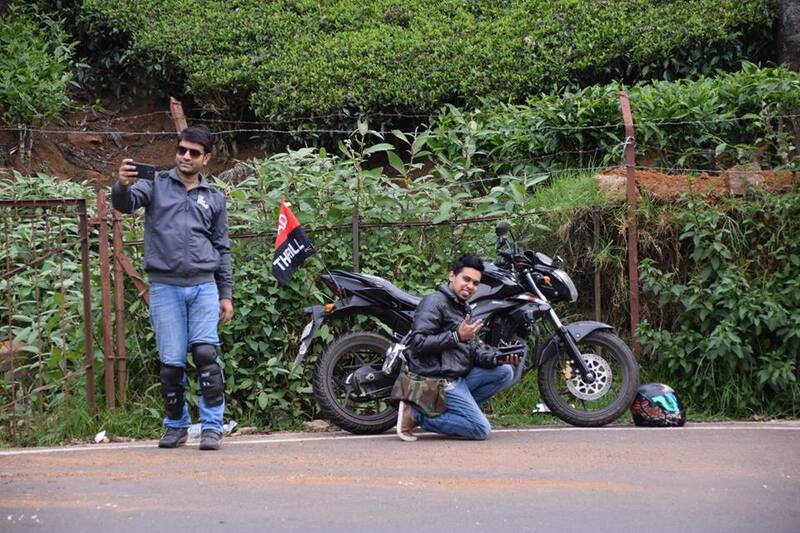 We rode back downhill and visited the nearby tea factory. As Phani and Rajesh were grabbing some tea, I was mesmerizing the sun set view. There were 2 other bikers doing some photography there. I had seen both of the bikers somewhere but I couldn’t remember where. Suddenly my eyes fell on their bike club logo “Naked Wolves” and then I remembered seeing them on TV for Bajaj 200NS preview ad. 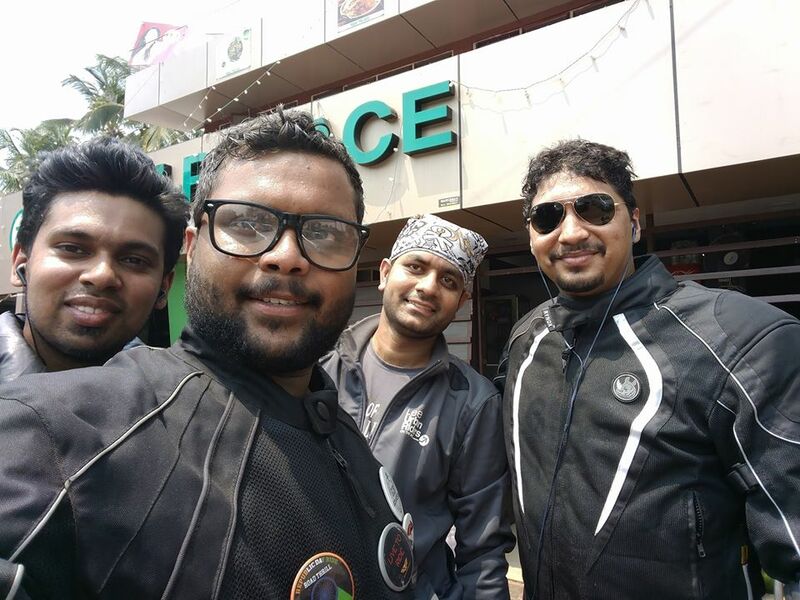 We had a quick intro of ourselves, discussing about the bike groups we represented, Discussing about Road Thrill, Gixxer Club Bengaluru and Naked Wolves, about the trip to Ooty and which all places were on the cards. Post greeting good-bye to them, we 3 (Rajesh, Phani and I) headed back to Ooty city. We spent some time taking few rounds in the city market, eating those garma garma bhajjis and pakodas. We were tired, we were sleepy, we headed back straight to the room, had dinner which we got it parceled from Youth Hostel and off to bed. After having some tea and biscuits which Phani managed to get it early morning, we were ready to start the day. 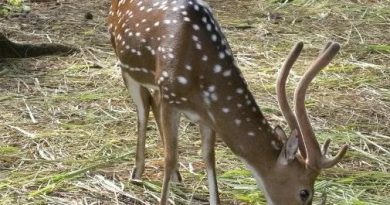 The first place to be visited was Doddabetta Peak. We got all our bags mounted on our bikes and started the ride. As we reached the peak, to our horror there was no place to park our bikes, it was that full. But we somehow managed to find a place to park 3 bikes. We were worried about out luggage as we did not want to leave it on the bikes nor did we wanted to carry with us. We spoke with the tea shop there and the shopkeeper said you can drop your bags on his Maruti Omni. Along with our luggage, we had a laptop as well. Thanks to the tea shop owner to guard our luggages. 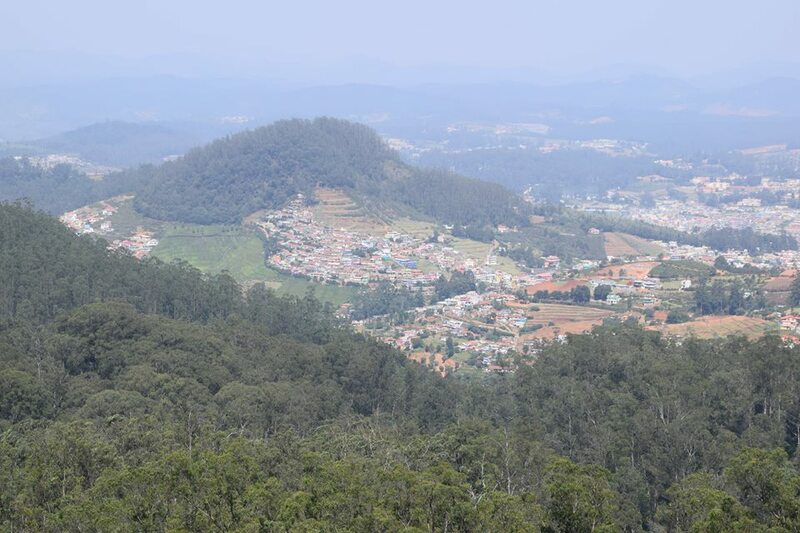 It was a good time spent at Doddabetta with some photo session with the beautiful view of Ooty city. 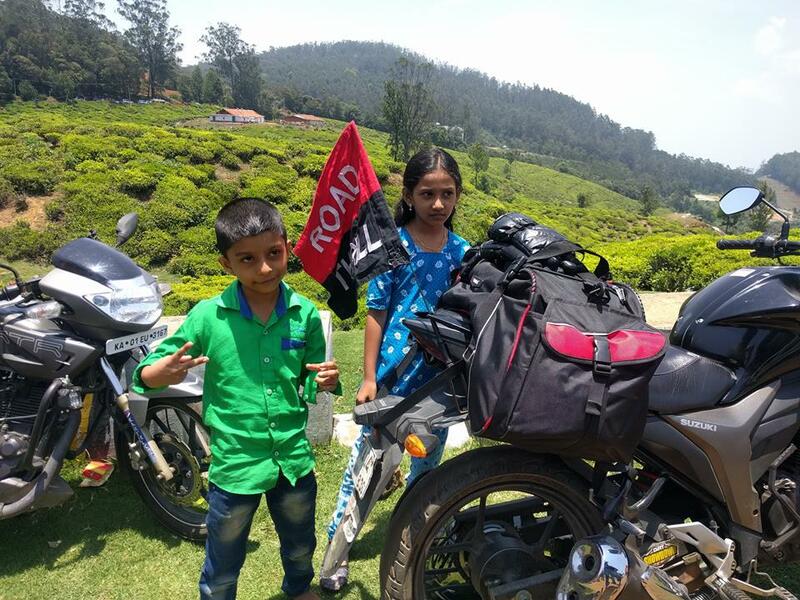 Kids loved posing with our bikes and RT Flag ! ! ! ! ! Phani and Rajesh both taking selfies, where should I pose ?? The confused me !!! The next destination was Muzhapilangad beach near Kannur. 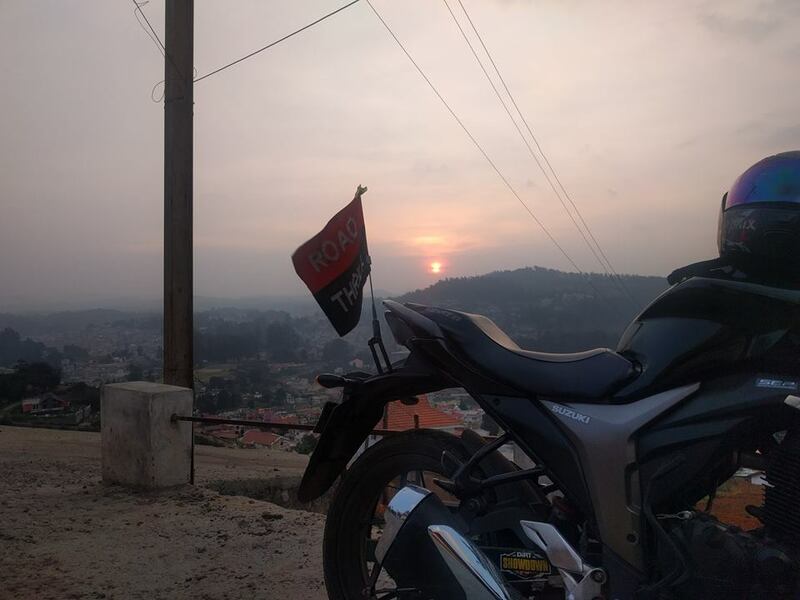 It was 2pm in the afternoon when we left Ooty city. 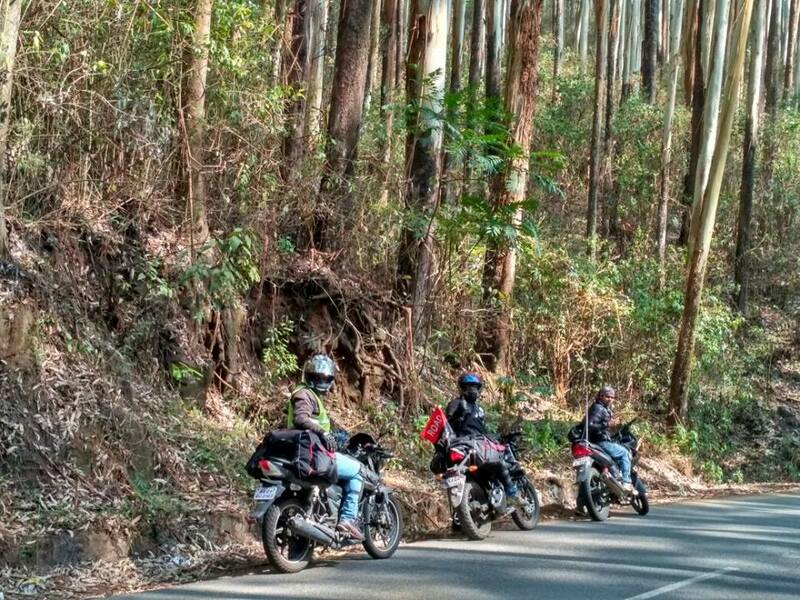 We took the Gudalur forest route, the most scenic route from Ooty as the roads on either sides were covered by huge Nilgiri trees and riding those forest roads was good. 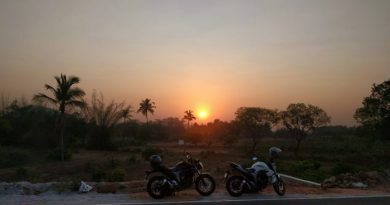 Post a small pit-stop for tea, we entered the roads of a small place called Pandalur and riding through the blush green tea estates during dusk time with few droplets of rain was mesmerizing. 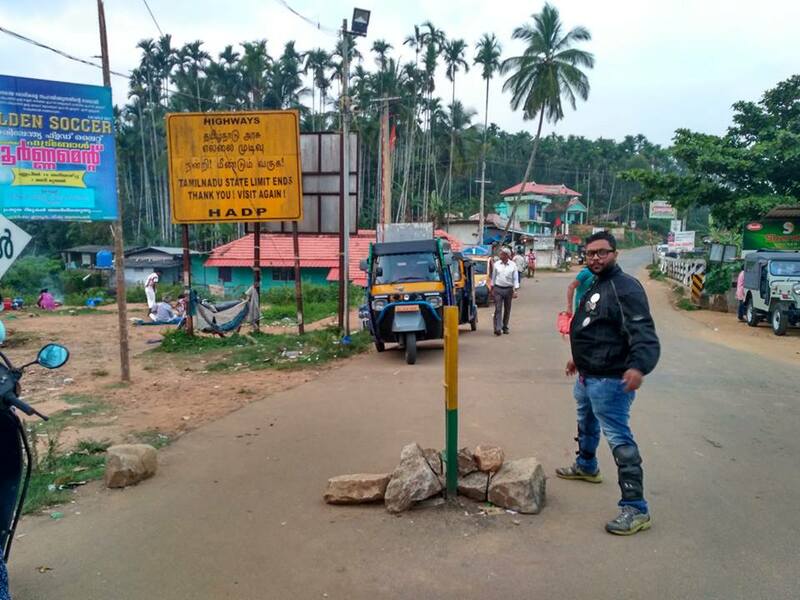 It was around 6pm when we stopped at the Tamil Nadu – Kerala border check-post to have some food, post some yummy delicious dosa’s, I went near the check-post gate to take a pic. The kind of pic which I always wanted where I stand on 2 different states at the same time. 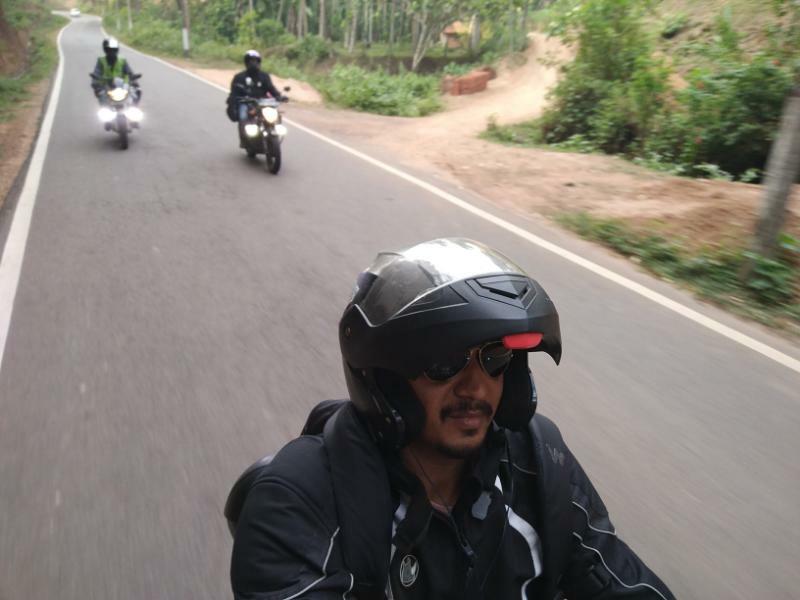 The ride through the forests of Kerala was crazy again. It was around 9.30pm where we just entered a forest stretch “Malabar Hill Highway” and I saw a sign board 5/5 Hairpin bends ahead. We were the only people riding on the roads. We were riding downhill and even though we applied both brakes on our bikes, the bikes kept moving down. Post crossing a place called Perivayoor, we stopped for dinner on the road side hotel at around 11pm. From here Kannur was around 50kms. We finally reached Kannur at 1am and just checked in to a normal lodge. 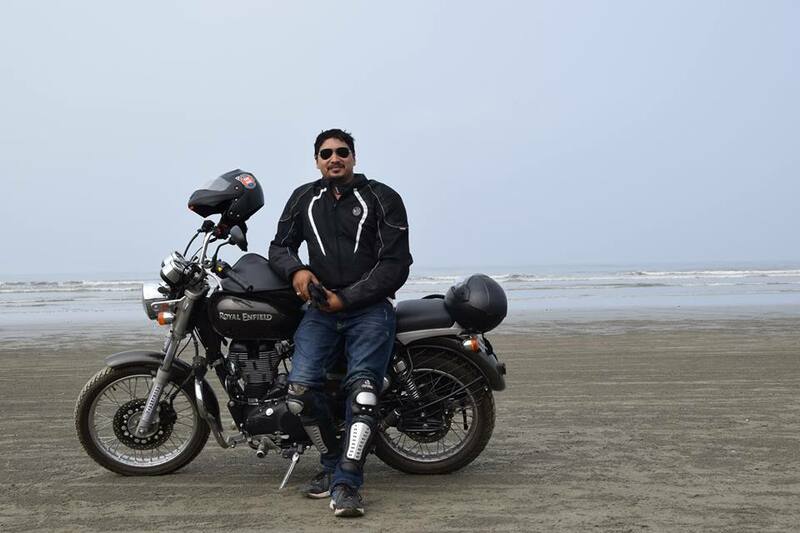 We were riding for the whole day covering 280kms in approximate 11 hours. 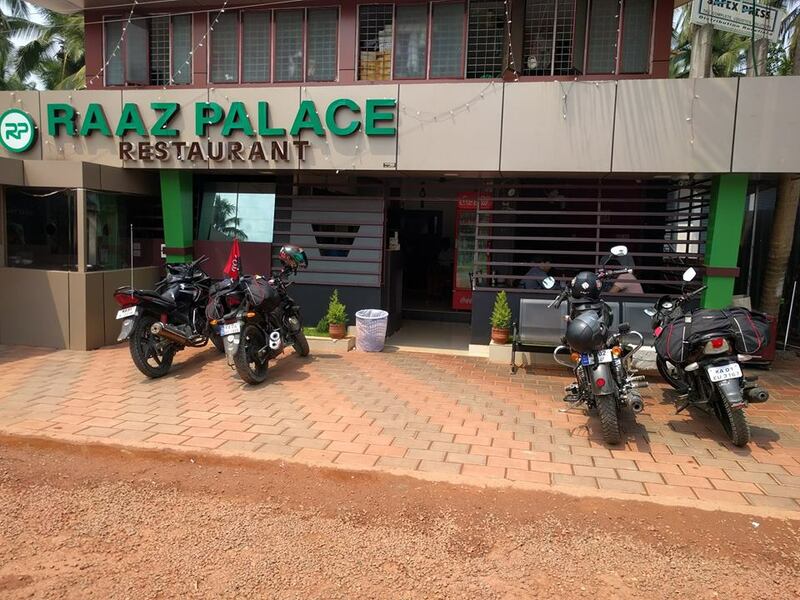 As soon we checked into the hotel, I called my brother who was on a ride to Mangalore. I told him about our plan for the next day. 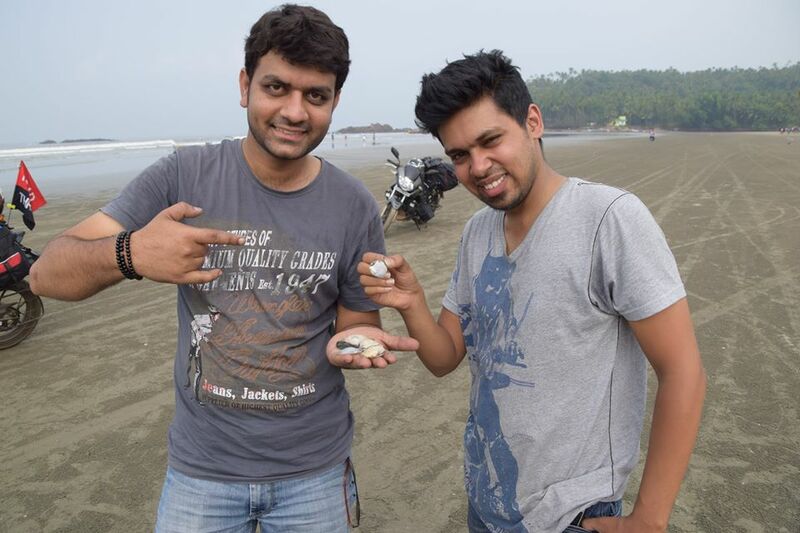 He was excited to join us to Muzhappilangad beach. 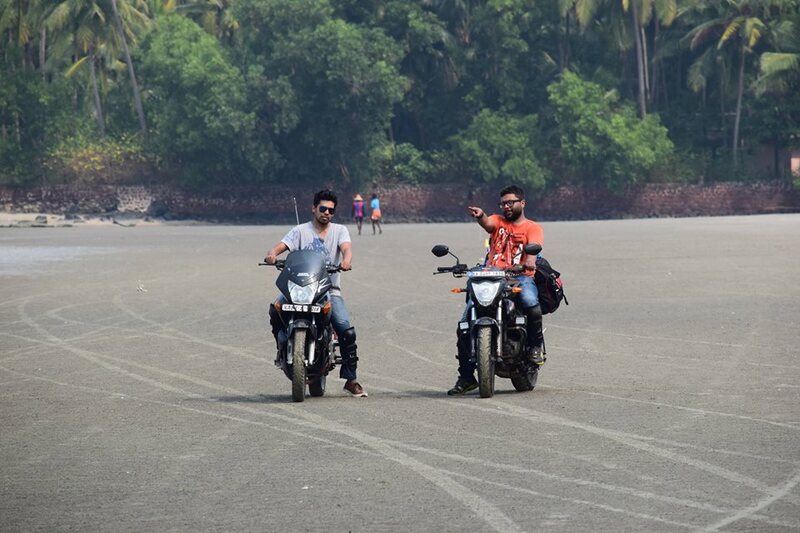 As my brother reached Kannur, we all rode to Muzhappilangad beach. 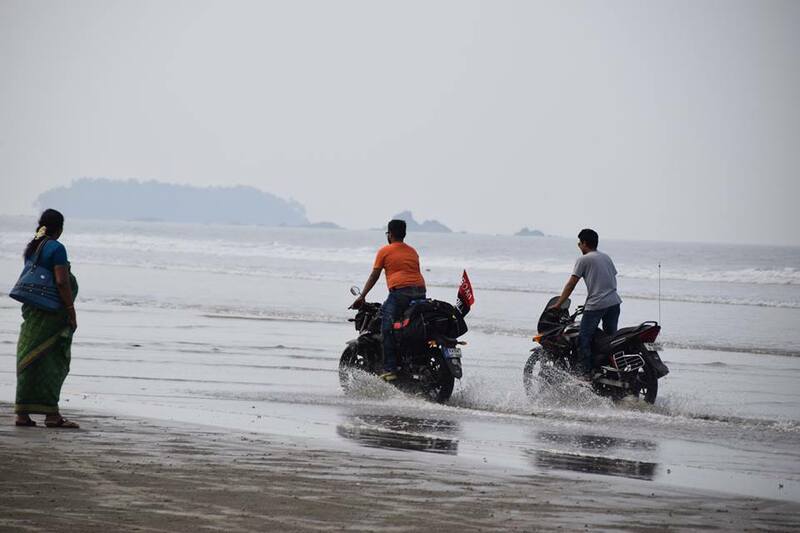 A very famous beach in Kerala and is known for the longest drive in beach in India and every one of us were enjoying the ride on the sea shores. We could see people waiting for the waves to hit the shore and ride as the water waved beneath the tires. This goes as my FB cover pic for now….. !!!!!! That’s my Riding Partner in my family . . . !!! Cheers mate .. .. ..
Had to park my bike with a Wheel-spin on the sand . . . . .
Aunty please chill maadi, we are crazy guys ! ! ! ! ! A good time spent with my friends and my brother, a good photo session on the beach side. We were also lost watching the blue sea all around. 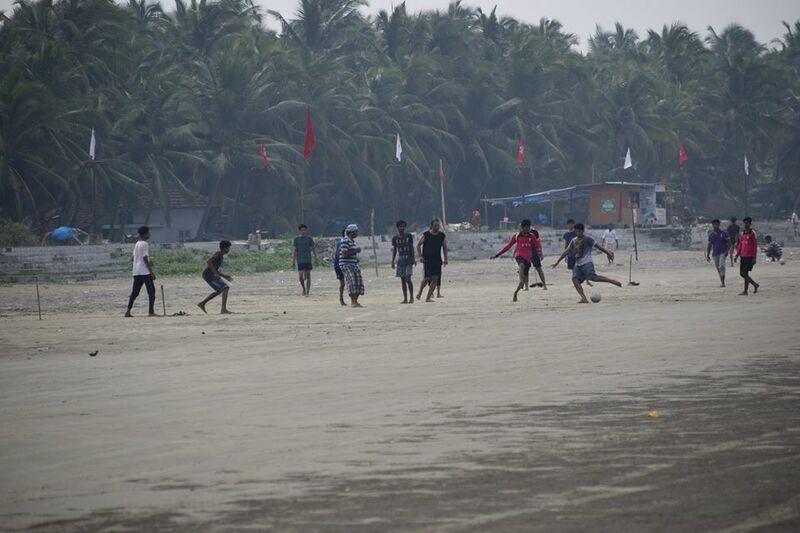 Football on the beach side…. wow…. thats fun !!! 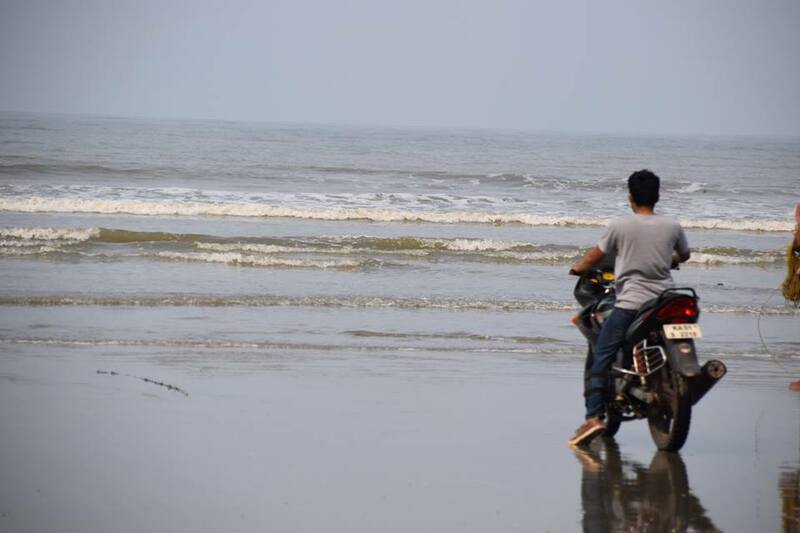 Hope to ride on this beach sometime again . . . Fish Curry at this restaurant was superb. 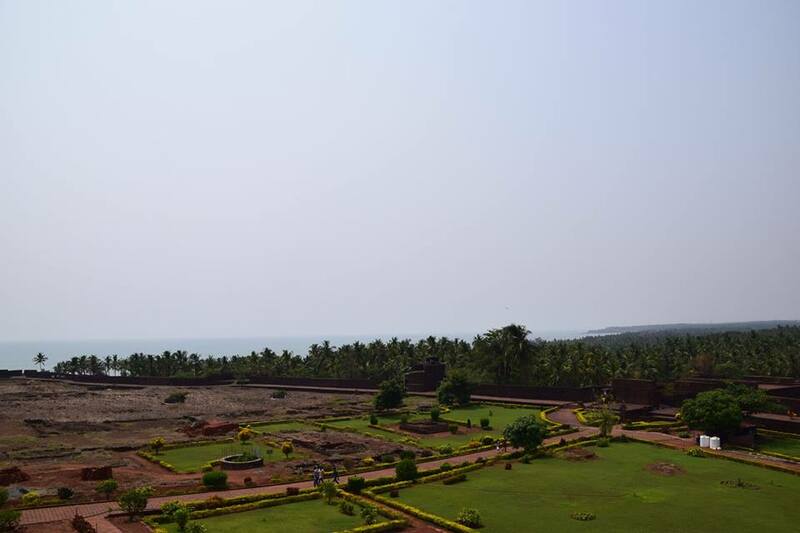 Post a delicious breakfast, Phani rode solo to Bangalore and we continued to Bekal Fort. 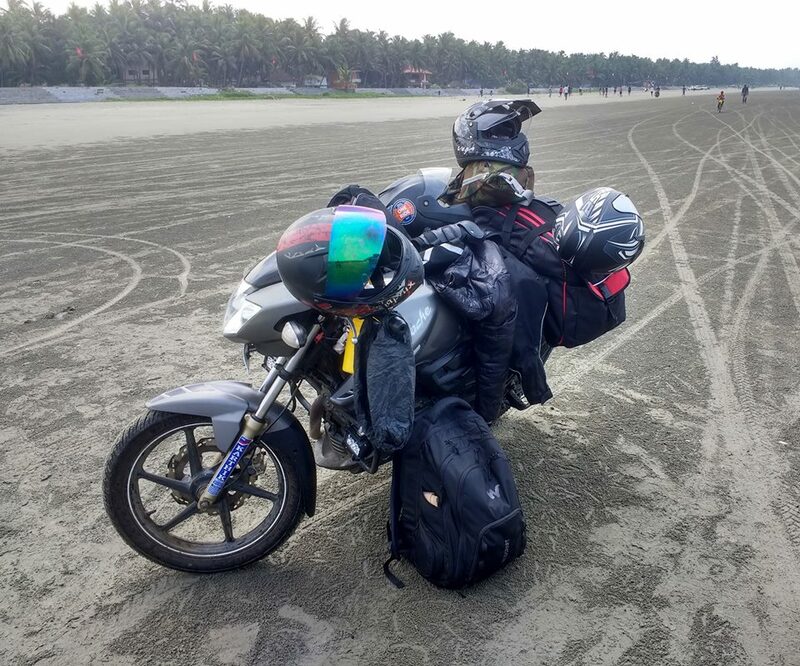 The roads were surrounded by lot many coconut plantations, many of road bridges across the rivers as we rode through the Coastal roads of Kerala which took us approx. 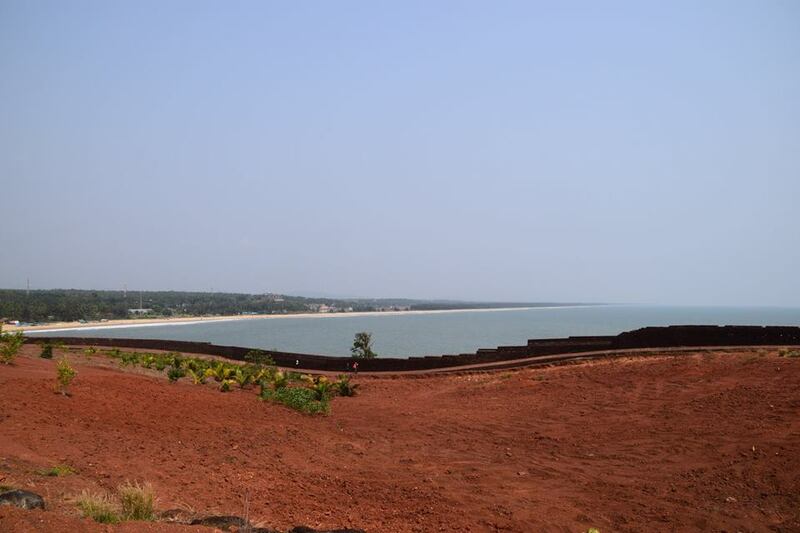 2 hours covering 75kms to reach Bekal fort. 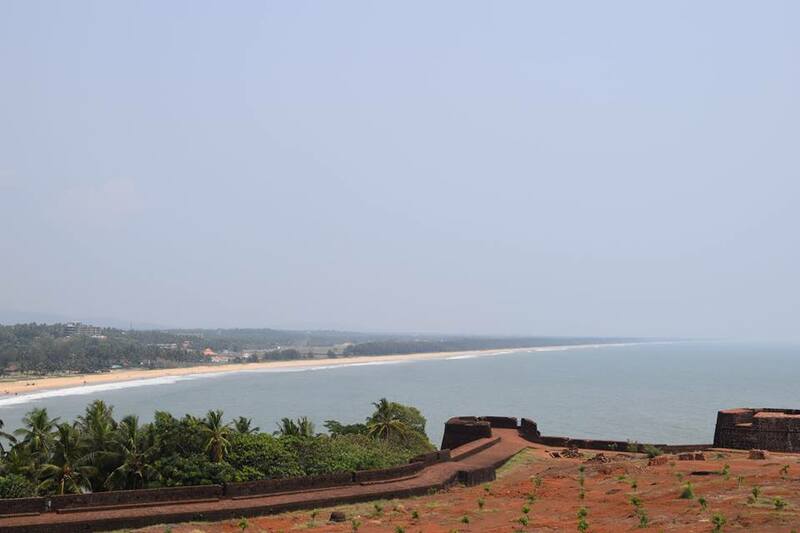 Bekal is the oldest fort in Kerala and surrounded by the sea and coconut plantations. Many movie songs have been shot at this fort. A very cleanely maintained fort, appreciate the efforts put by the Kerala Government and Archaelogical Department of India. We rested for an hour outside the fort at a juice shop to have some chilled water melon juice. It was summers and the climate was extreme hot. We started our engines to start our ride back home (Bangalore). 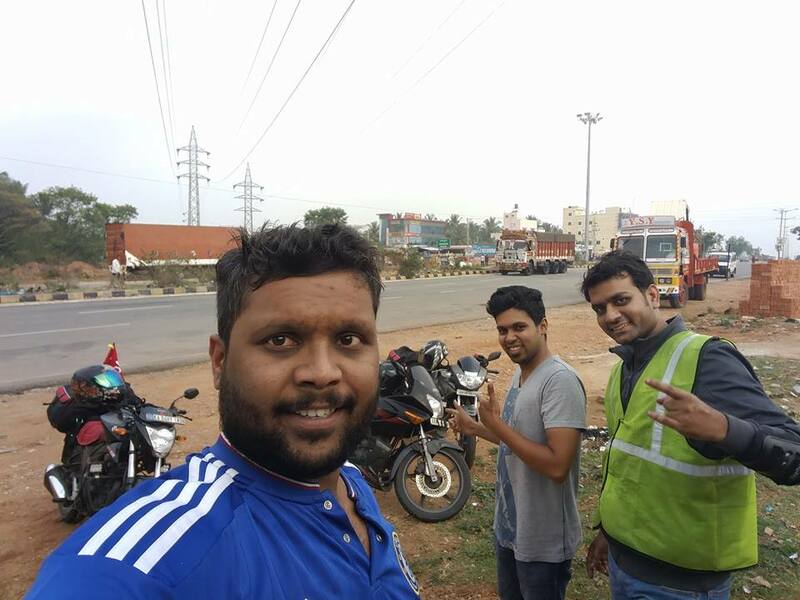 As we entered Karnataka, we stopped at a junction somewhere near a place called Sullia in Mangalore District where my brother Akshay and I were debating on the quickest route to Bangalore. 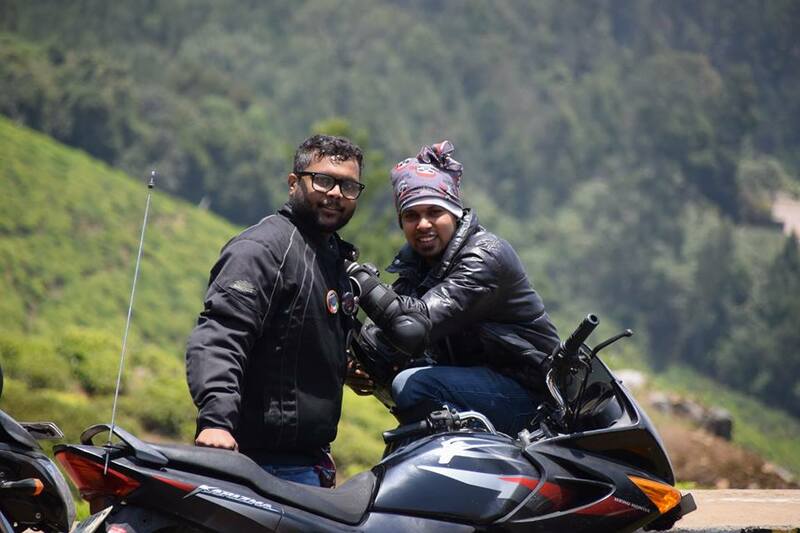 Both of us had switched on the GPS, Akshay had only mentioned Bangalore as the destination but I eagerly wanted to ride through Shiradi Ghat and added Sakleshpur in my map to Bangalore. I somehow convinced Akshay and Rajesh to take the Sakleshpur road. This road via Sakleshpur was yet another ride through the thick forests. We took a pit-stop amidst the forest route in a village to have some tender coconut water and then rode till Kukke Subramanya. We got the air pressure of bike tires checked as we had to ride the Shiradi Ghats only to ensure we don’t face a problem of a flat tire. The rain poured as we started riding uphills of Shiradi ghats. 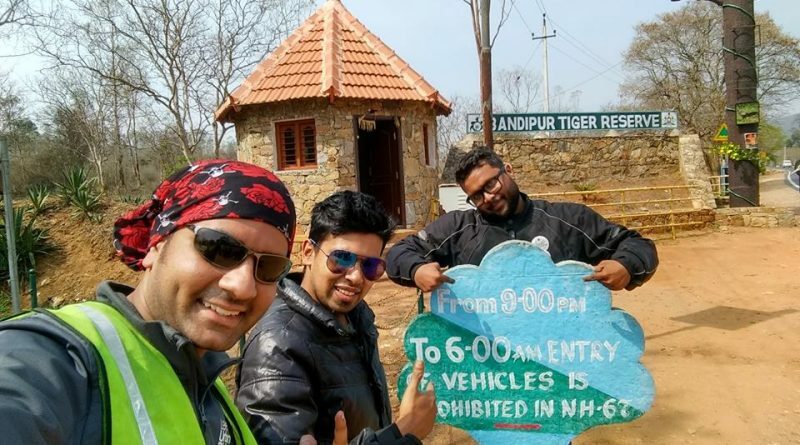 This stretch kept all 3 of us on our nerves, we were riding the dangerous road of Karnataka under the wrath of the rain gods and it was dark. This stretch of 30 odd kms you will see heavy movement of tankers and lorries shipping fishes. 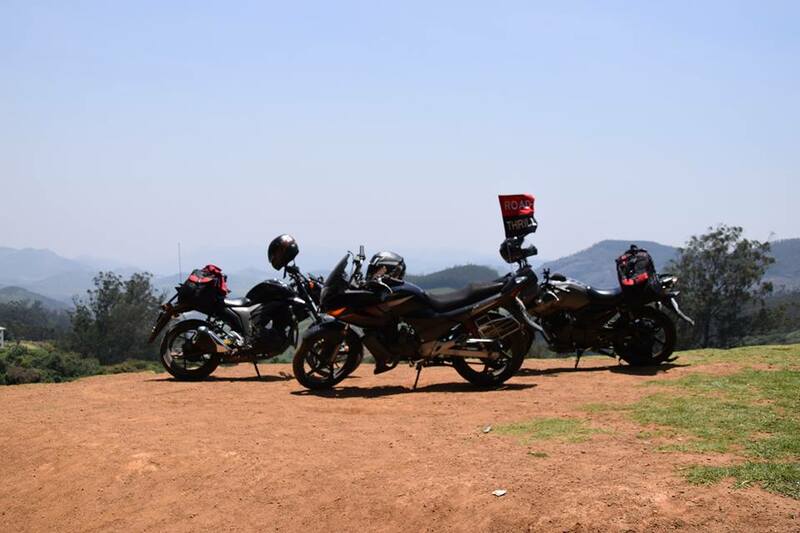 As the ghats finished and we stopped in Sakleshpur to have some garma garm bhajji, we all said, “This was one crazy stretch, we want to ride this ghats again” and meanwhile Phani had already reached home taking the Mysore route. We stopped over for dinner at a dhaba near Hassan. 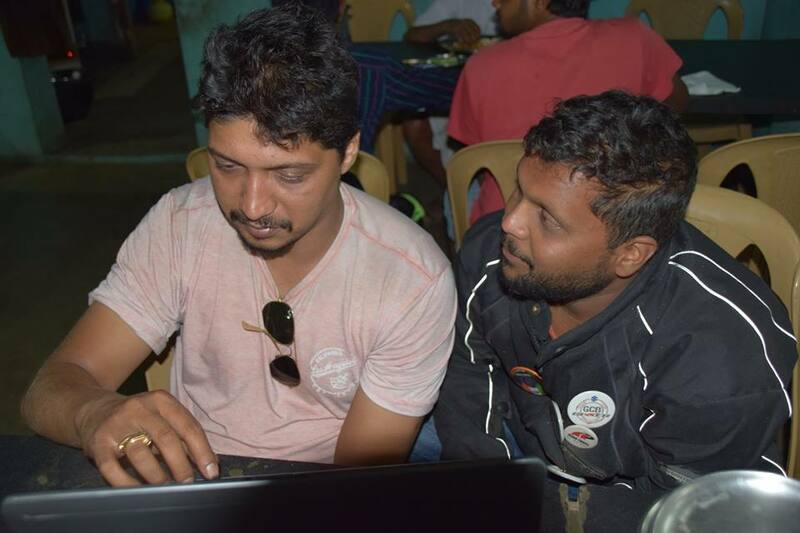 Until the food was served, we got the pics from the DSLR copied to the laptop and scrolling through the pics. Bhai, when is the next ride ? ? ? Untill Hassan, our entire trip was in the ghats and forests, and now we got highway road and we wanted to just zoom off home, many pit-stops were taken for tea as we all were tired and sleepy. We reached Yesvantpur at 3.00am and all dispersed for their respective homes. At a point in Sheshadripuram, I stopped in the middle of the road; I forgot my way back home and I quickly switched on my mobile GPS to assist me the route back home. 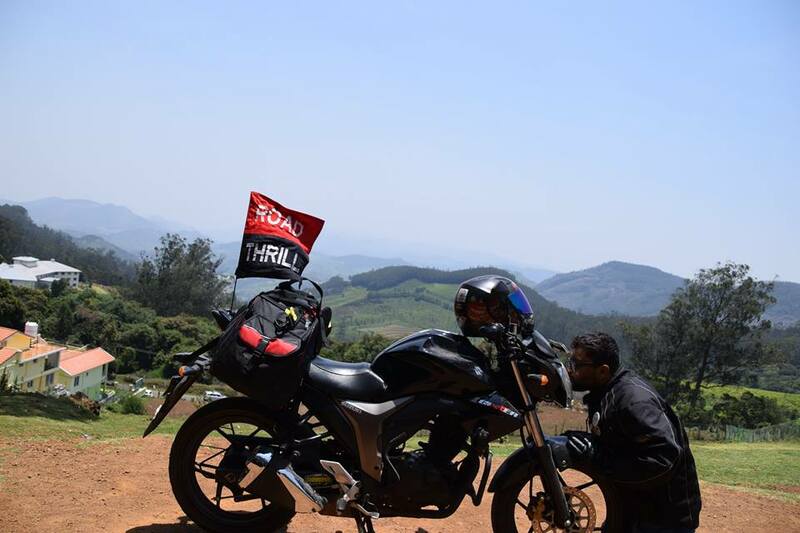 It was yet another memorable trip covering 1093kms, riding through places in Karnataka, Tamil Nadu and Kerala and most of our riding was in ghat sections. 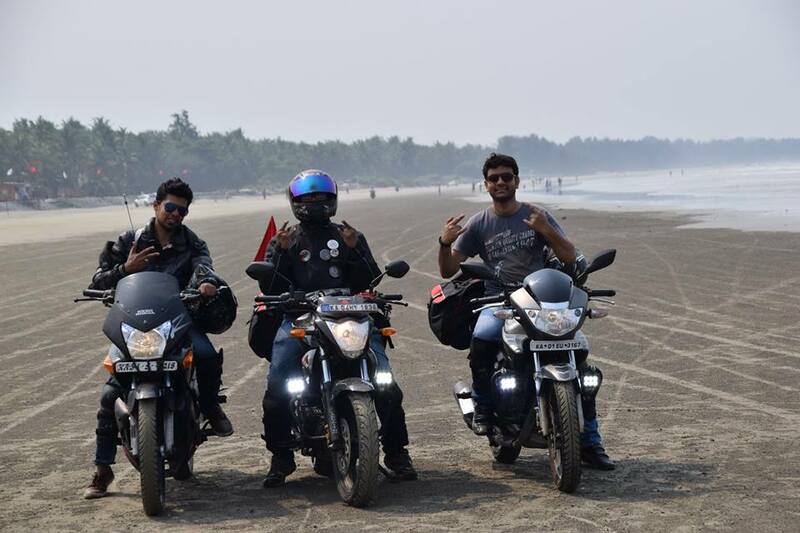 Hence the title “The Ride of 3 States: Trail of Ghats”. Thank you everyone for making this trip a memorable one, hope to have more of such memories with you all. 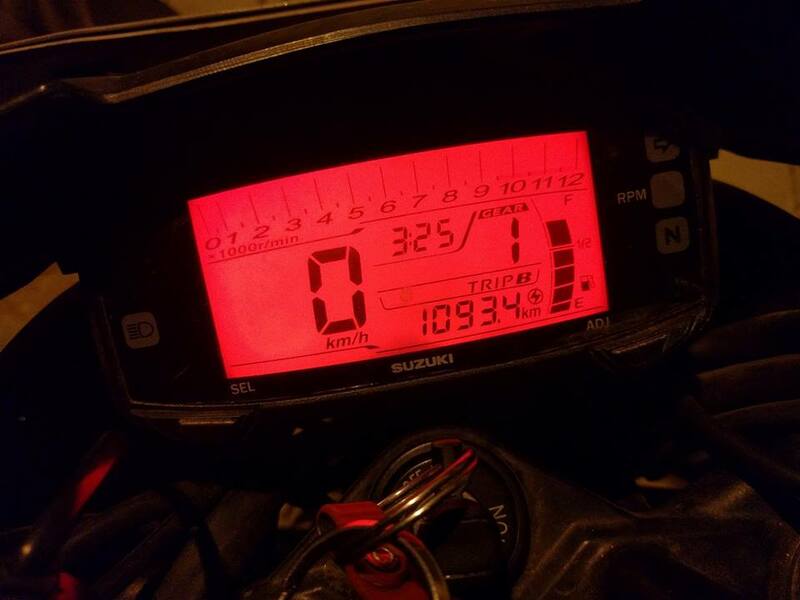 Stay tuned until I blog another of my travel story, Stay safe, Live Free Ride Hard.